It features a square shape. This vessel set is designed to be installed as a above counter vessel set. It is constructed with ceramic. This vessel set comes with a enamel glaze finish in White color. It is designed for a 8-in. o.c. faucet. Above counter white ceramic square vessel. Premium white glaze for a glossy finish. Kiln dried ceramic construction. Standard US plumbing connections. High-quality ceramic cartridge. Smooth non-porous surface prevents from discoloration and fading. Large integrated bowl with raised edges. Completely finished all around including back. This model is designed with integrated hot-cold supply lines for standard US plumbing connections. Two handles for ease of operation and smooth temperature control. Double fired and glazed for durability and stain resistance. Quality control approved in Canada. All mounting hardware and hot/cold waterlines are included. Constructed with lead-free brass ensuring durability. Re-inspected prior to shipping your order. Faucet and accessories not included. Designed for easy installation. Installation instructions included in the box. Only faucet is CUPC approved. 1.75-in. standard US drain opening. Recommended drain for this sink is 871211017961.. Luxury bulky solid brass look and feel - not the cheap stuff. Quality control approved in Canada and re-inspected prior to shipping your order. 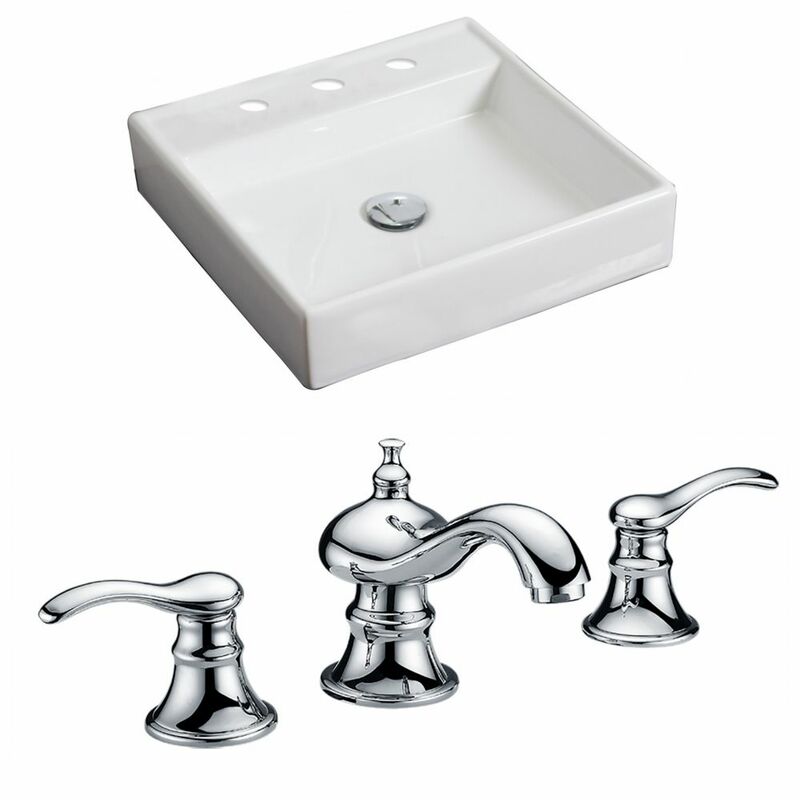 17 1/2-inch W x 17 1/2-inch D Square Vessel Sink in White with Faucet It features a square shape. This vessel set is designed to be installed as a above counter vessel set. It is constructed with ceramic. This vessel set comes with a enamel glaze finish in White color. It is designed for a 8-in. o.c. faucet.